Last Thursday The Augustine Academy hosted our second annual Veterans Day Chapel with local veterans and members of the community. Students were given the opportunity to engage in relationships with those who have served, varied in rank and command, with many different stories to share. 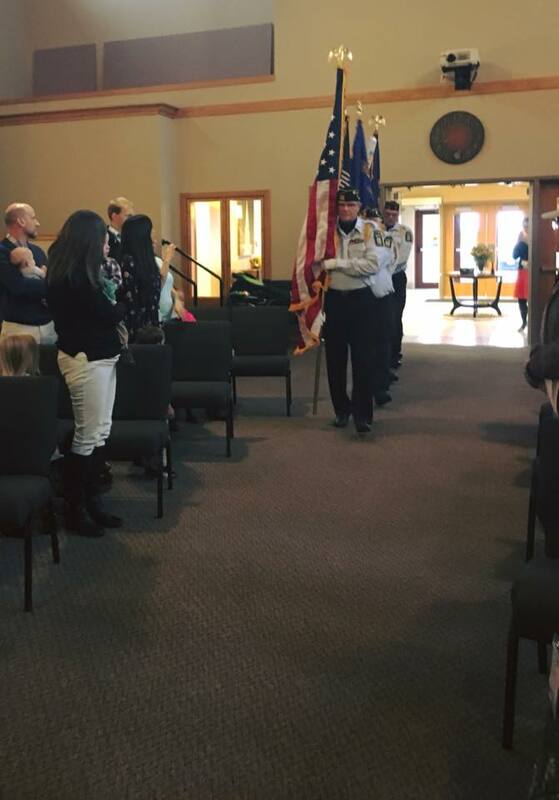 During chapel the Hartland American Legion and Marshall Johnson VFW posted colors, students sang patriotic songs, and two of our students introduced family members who shared stories of their service in the US Air Force and the US Army Reserves. To conclude the service, our Kindergarten through 2nd grade class recited the poem, “In Flanders Fields” (see below) and delivered handsewn poppies to all veterans in attendance as a token of thanks. Our morning concluded with a reception in which our third through eighth graders sat at table with Veteran guests to ask questions and learn more at a personal level. The students’ favorite stories seemed to center on one veteran’s experiences with monkeys in Vietnam! We’re grateful to all those who attended and invite you to join us next year!